For Gourmand’s new Beijing Cookbook Fair, launched this year, publishers came from around the world for a taste of China’s and the world’s $4bn cookbook market. In many markets outside the United States and Europe, publishers are seeing double-digit growth in cookbook sales, said Edouard Cointreau, founder of the new Beijing Cookbook Fair, which took place on May 18-21, 2014. Cointreau was speaking at the kick-off event of this fair, the “Future of World Cookbook Publishing Forum,” which included speakers from China, Canada, Sweden and the United States. Cookbooks are a $4 billion annual business worldwide, Cointreau told the audience, and China, in particular, is a growing market for cookbook publishers. Food television is gaining in popularity across China – specifically the hit show, “Bite of China” – and consumers are increasingly interested in cookbooks. Jiangtao She, Vice General Manager of Phoenix Publishing Group in China, confirmed this trend. In all of 2013, cookbook sales at Phoenix totaled $80 million. However, Phoenix counted $100 million from cookbook sales just in the first half of 2014. She also said that while the quality of cookbooks in China continues to increase, Chinese publishers are looking to learn more about cookbooks from foreign publishers. An important component of the Beijing Cookbook Fair was its Rights Center, where 40 publishers from as far away as Chile, Sweden, the USA and Australia booked tables and held meetings to discuss foreign rights. “I would like to see if our books could sell here,” said Ulla Joneby, Rights Director of Sweden’s Albert Bonniers Förlag, where cookbooks are the strongest category. 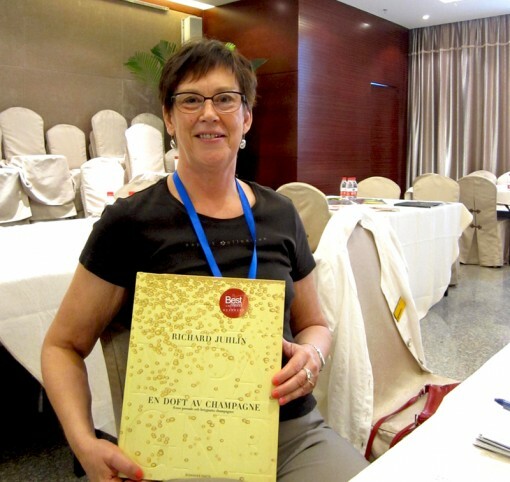 Joneby’s exploratory trip to Beijing Book Fair paid off, and she landed Bonnier’s first foreign rights deal with China – A Scent of Champagne by Richard Juhlin, which sold to Artron. Joneby reported “great interest” in Bonnier titles from five other publishers at the fair. “I’m overwhelmed…I didn’t expect that great interest in our cookbooks,” she said. Robert J. Dees, president of Toronto-based publisher Robert Rose, also reported making new contacts with Chinese publishers during the fair. His approach to working with his Chinese contacts is to “really try to listen and understand the needs” of this market. “It’s not the same market,” he said, and the key is to “[come] up with solutions” that work for Chinese readers. 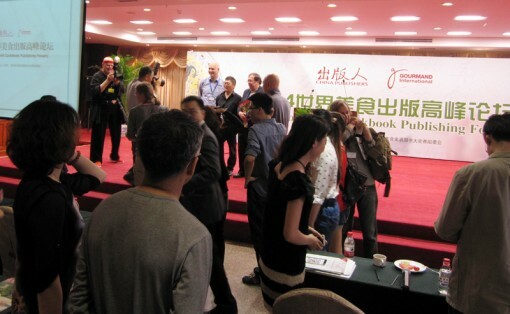 Traditional publishers weren’t the only attendees at the Beijing Cookbook Fair this year. 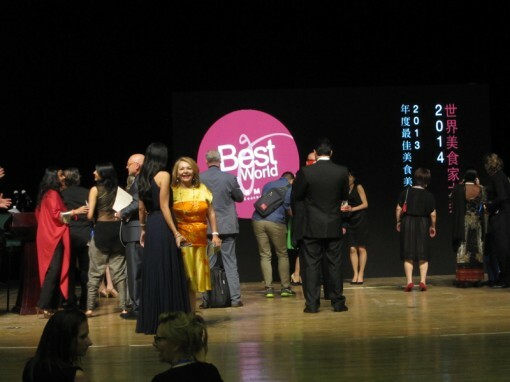 The Gourmand Awards, which take place during the fair and recognize the “best cookbooks, drink books and food television” around the world, nominated a number of indie publishers, authors, photographers and others. The Four Wallas team with their first cookbook, Sri Lanka Food. 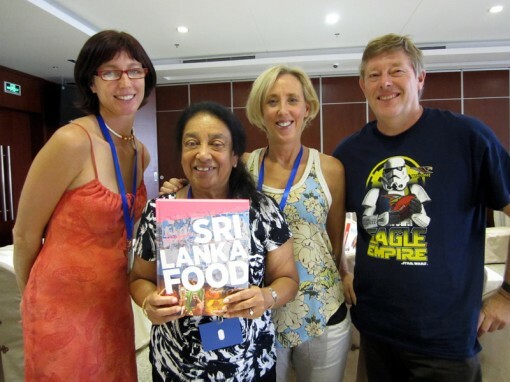 One of the indie publishers who won a Gourmand Award this year was Four Wallas Publishing for their first book, Sri Lanka Food by Saragini Kamalanathan. Magazine editor Norman Burns approached Kamalanathan after taking one of her cooking classes in Perth, Australia to ask if she ever considered doing a cookbook. Together with photographer Craig Kinder and designer Cally Browning, they took a trip to Sri Lanka to gather material for the book. After taking the finished product to several publishers, the group decided to publish the book themselves. Burns said that they had some “promising meetings” in Beijing, and they were delighted to receive positive feedback from other publishers who attended the fair. One the second night of the Gourmand Awards, one award recipient thanked Mr. Cointreau “for the spirit” of the awards and the fair. 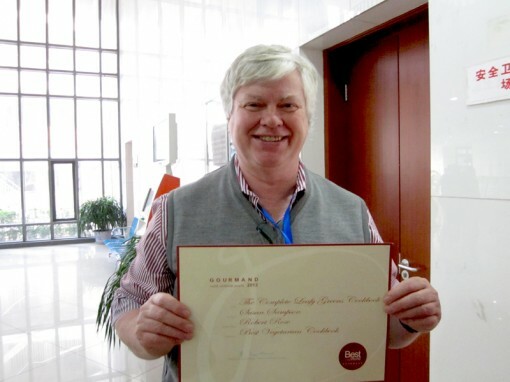 This “spirit” – a pervasive enthusiasm and energy for the topic of food and wine – was evident during the events of the Beijing Cookbook Fair. From the cheers that went up each time another award was announced to the excitement from the publishers over rights deals and new connections to China, it’s clear that this passionate community of food and wine lovers is already looking forward to next year’s Cookbook Fair. Note to readers: Publishing Perspectives won a 2014 Gourmand Award for Best Book Magazine.